Dog detectives Lu and Clancy have decided to take a vacation cruise. But a mysterious figure has other plans for the canines. Awesome Arabella, the beautiful feline magician, is on board with a bag full of tricks. And when a suspicious shipboard robbery occurs, it's up to Lu and Clancy to crack the case of the missing jewels -- and the vanishing cat. 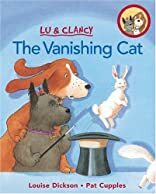 In this activity storybook, kids help Lu and Clancy solve the mystery as they discover the secret to doing simple magic tricks.